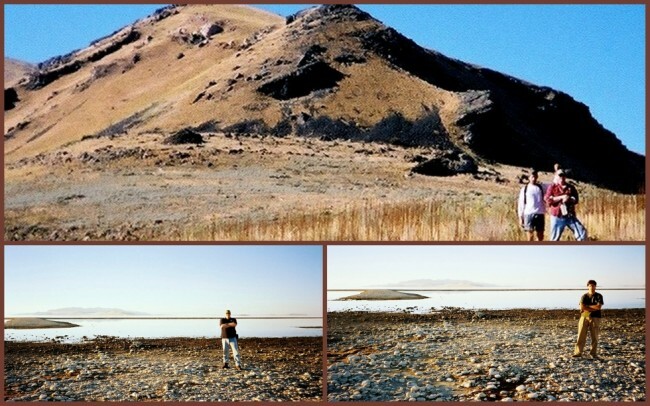 Salt Lake City lies in a low lying area once known as Lake Bonneville, an ancient sea which covered hundreds of square miles in Utah, Nevada and Idaho. As Bonneville receded, it left behind the Great Salt Lake, Sevier Lake, Utah Lake, the Great Salt Lake Desert and the Bonneville Salt Flats. Four major shorelines were created which are still visible today as terraces. They are: the Gilbert shoreline (12,800 to 11,600 years ago), the Provo shoreline (16,800 to 16,200 years ago), the Bonneville shoreline (18,000 to 16,800 years ago) and the Stansbury shoreline (24,400 to 23,200 years ago). Each of these shorelines indicates a period where the water level remained stable for an extended period of time. In the lake of today, there are 11 recognized major islands. This number can vary depending on the level of the lake itself. As the level recedes, more islands can surface. 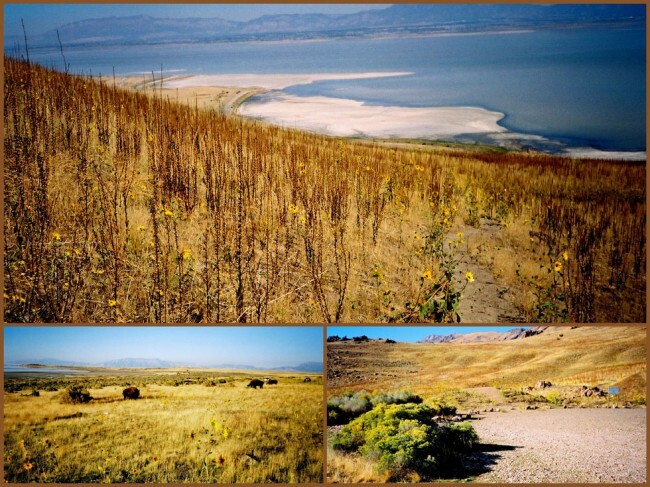 One of the most well-known of these is Antelope Island. 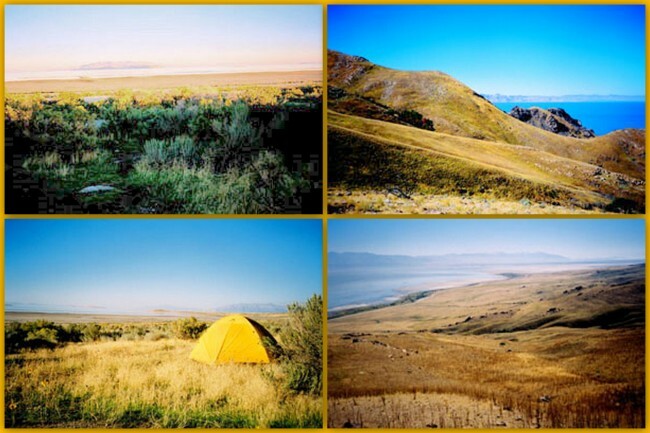 On this island (23,175 acres) is the Antelope Island State Park, an outstanding area for exploring. 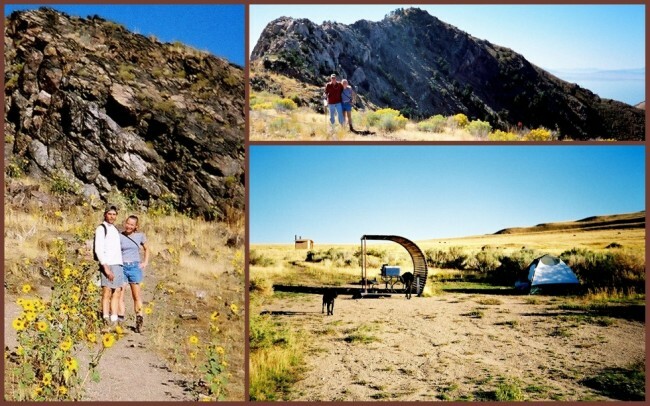 There are nine primary hiking trails, totaling 40 miles, ranging in length from ¼-mile up to 11.8 miles. The only way to get onto the island from the mainland is by driving over the Antelope Island/Syracuse Causeway. On a very warm, autumn day my friends Jeff & Rachelle Campbell (and Black Labs, Jessie & Jackson) and I headed up the Frary Peak Trail, a 4.5 mile, uphill trek. As it was in the fall, we were greeted by the fragrance of the brine shrimp which had begun to die off for the season. It’s a smell you won’t soon forget. Almost immediately we found ourselves heading up a steep, but excellent trail toward the summit, 6,597 feet above sea level. Though the overall distance isn’t terribly far the grade made it a challenge. We encountered beautiful 360° vistas, tons of late-season wildflowers, and with every step, an increasingly dramatic view of the Great Salt Lake. Be advised this trail is closed from April 15th through June 15th for the Big Horn Sheep lambing season. Last modified on: February 3rd 2014.